With a coup averted the reluctant crew of the Destiny is back on the same team — and just in time. As Sara reaches Season One’s “Human” she’ll get a critical look into the past, as Dr. Nicholas Rush recalls his recruitment into the Ninth Chevron Project and grows increasingly obsessed with deciphering Destiny‘s master control code. 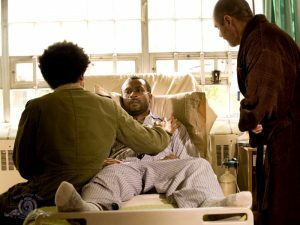 Then, in “Lost,” Ronald Greer is left for dead and Lt. Scott leads a team in a desperate attempt to catch up with the ship after it jumps away to F.T.L. So, an episode called “Human” starts with Rush? Is that ironic? Using the Ancient chair to give us a backstory for Rush is a great story-telling device. I know the Earth-based bits are all part of Rush’s lucid dreaming and he is using the opportunity for his benefit and this is all something that he’s lived through before … but his callous attitude toward the memory of his dying wife just makes me hate the dude more than I already do. These sequences are just a window into his huge, ego-centric soul. The Destiny / planet-side part of this episode’s storyline really distracts from the Rush plot. I wish they had trusted the intrigue and mystery of the dream sequence to carry the full episode. 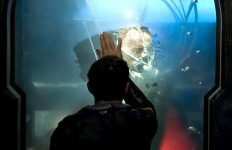 The intensity of emotion in the dream is an awkward juxtaposition to the comedy / horror romp that Eli, Chloe, Scott, and Greer get up to in the tunnels. So I had no interest in finding out if 2Lt. James and her crew were going to be able to rescue Scott and Co. We all know they’re going to survive. Thor help me, I want more Rush. 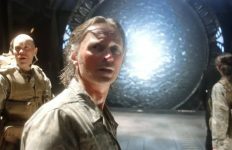 Eli and Chloe — my ship of choice for SGU — is an obnoxious distraction that, I have to confess, in this moment I want to go away. In the end, I think either story would have made a good solo story for an episode. Cramming them together made them distractions from each other. 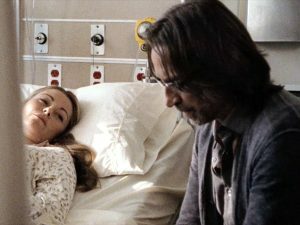 I love to hate Rush, and I wanted to watch him struggle with admitting to himself that he misses his wife, that she made him a better person — and that being unable to save the crew of the Destiny reminds him of how he could not save his wife. Nicholas feels helpless. He feels like a failure. He knows why he is the way he is, and chooses to wallow in it. I want a full episode exploring that. Sgt. Riley, a.k.a. 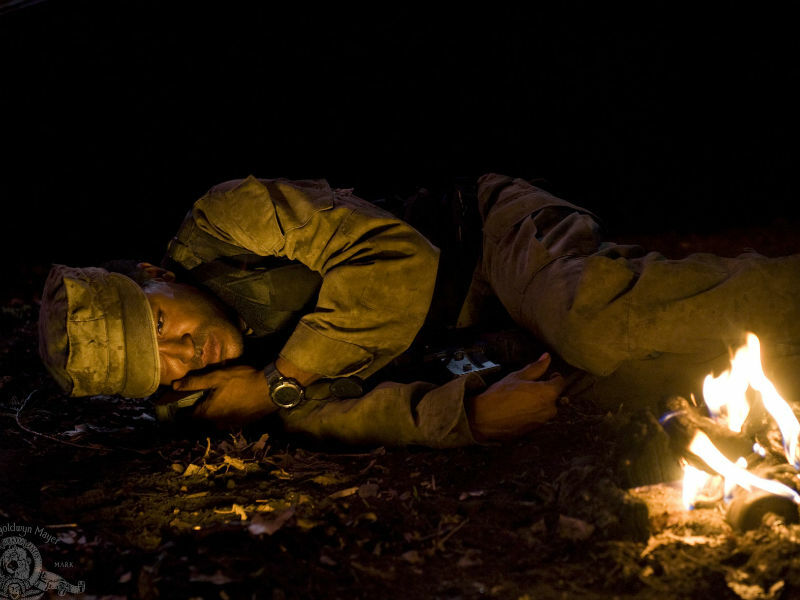 Eli-lite, attempts to document the efforts to rescue Scott and Co. from the Land of the Lost and his kino battery dies. And then Destiny goes into full-on Power Save Mode. In the Land of the Lost, Scott and the others come up with a plan to try to rescue themselves using the art of probability and gate travel … when the giant spiders show up again. Running from Shelob, trying to find their way out to safety, and still find the kino — Scott and Co. roam around lost and time-filling. 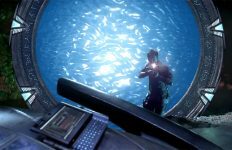 On the Destiny Rush makes the same observations on probability and gate travel, with the added knowledge that they are currently at the edge of the universe (what, no diner?). Rush and his team know what direction to travel in to try and rescue their lost crew members, and set off to find the Land of the Lost. The tunnels collapse on Greer, so we can get some convenient backstory on his douchebag of a father and his abusive upbringing. 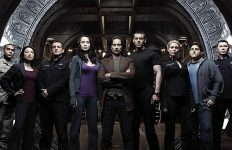 Greer is a character I’m looking forward to seeing develop over the rest of SGU. I think he has an intriguing backstory, and I want to see what drives him from that terrible home to become a military officer. Especially since his father was retired (ex?) military. That, and I like the performance of Jamil Walker Smith. He’s the sort of actor who can do a lot with a little. The question I have with this episode is that both Eli and Rush act as if there is some sort of sequential pattern when it comes to gate addresses. Nowhere else in the franchise hints at this. As far as we know the addresses have everything to do with physical location in relationship to specified constellations, not their proximity to other Stargates. Neighboring Stargates are not just one symbol off from each other. That’s a little like assuming that since my phone number is “555-1234,” my neighbor’s must be “555-1235.” I don’t understand why this episode is acting like the team can only go from left to right, Super Mario style, when in fact they can travel to any gate for which they have an address. So, you travel five gates in the “wrong direction?” Who cares? You don’t have to travel back through those five gates to get back to where you started. Just go back to square one. Overall, I had a hard time buying into the premise of this episode. 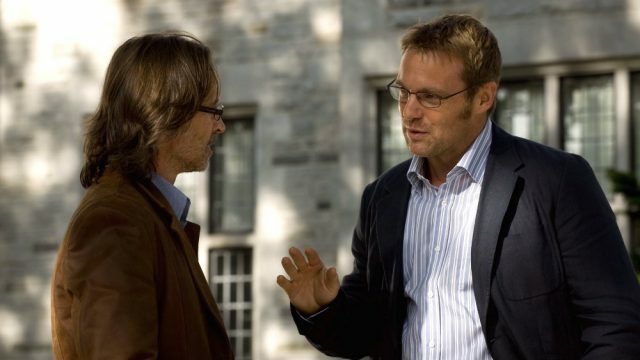 I wish “Human” had focused solely on Rush’s story and the “Lost” storyline didn’t happen. The only part of the episode I cared for at all was actually the backstory on Greer. Even T.J. telling Colonel Young she is pregnant didn’t add much here. At the end of the episode even the fact that Scott, Eli, and Chloe are still stuck in the Land of the Lost didn’t resonate much with me. The concept of what the writers are doing is nice. I like that complications are carrying over episode to episode. It’s one of the things I love about the Stargate franchise as a whole. But “Lost” in one that fell flat for me. In the Next Installment: Amanda Perry arrives on board Destiny in “Sabotage,” and the crew is plagued by hallucinations of their worst nightmares in “Pain.” Stay tuned! 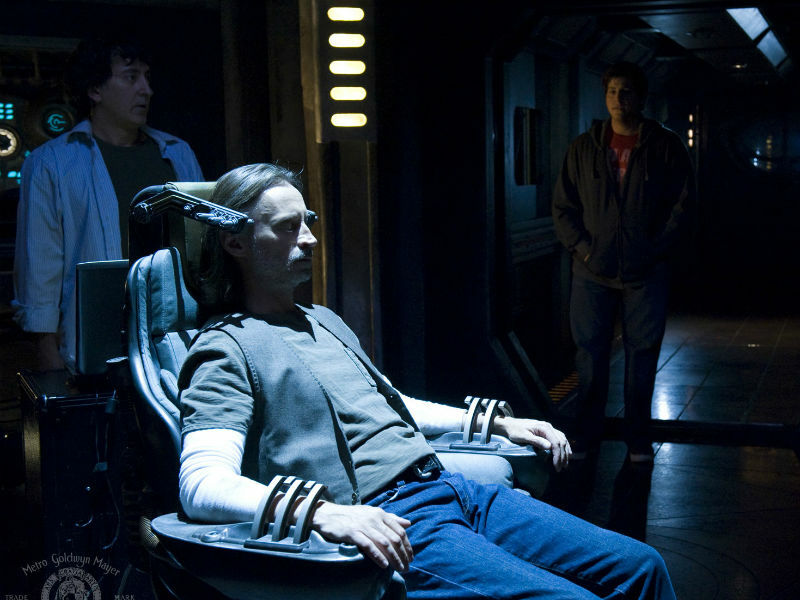 Read more about “Human” and “Lost” in GateWorld’s SGU episode guide. 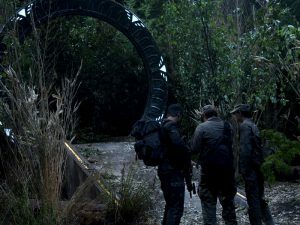 You clearly don’t understand how the gate system works differently in Stargate : Universe. 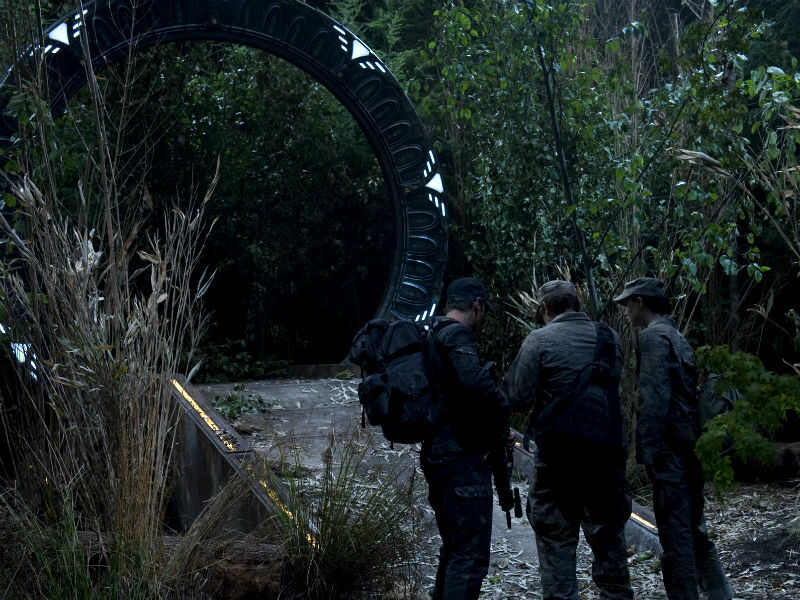 This is the oldest network with a limited range, so a stargate can not dial any other stargate in the same galaxy. It is a good show and truly belongs in the SG family. Hope you enjoy the series. Just wish they made more seasons.